It was by mere chance, during the Apulia Hi-Fi Show 2015, that I came across Vito Ottolino. We surely didn't meet through mutual friends, the talented guitarist was there and did perform in a live music showcase, event I did attend as well. I so had the opportunity to appreciate his music and, with that straight face which usually characterizes me, I did literally claim a copy of his latest work. So, as I was saying, Vito Ottolino's a guitarist & composer from Triggiano, a small town on the outskirts of Bari who, since childhood, has been very fond of guitar, played self-taught at first, but changing plans significantly while growing up to the point of acquiring a degree and becoming a middle school teacher. During his training, Vito Ottolino has played every kind or style of music from bossa nova to jazz, through rock (from brazilian music to acoustic blues, fingerstyle, rock) and various styles of guitar techniques, with some sort of musical eclecticism that has always influenced his artistic career as a performer and composer. He's collaborated with various artists with whom he's also released some albums and played in many live performances, and, talking about things that need to be mentioned, I'd like to point out the project 'Fabularasa' that won several contests no less. When it comes to music he's also an omnivore individual. Being in love with music itself and being also curious about all musical forms, he enjoys listening to all possible genres. To make it even simpler, he's a real artist whose purpose isn't fame, indeed we could say his only desire's being able to devote himself entirely to music. 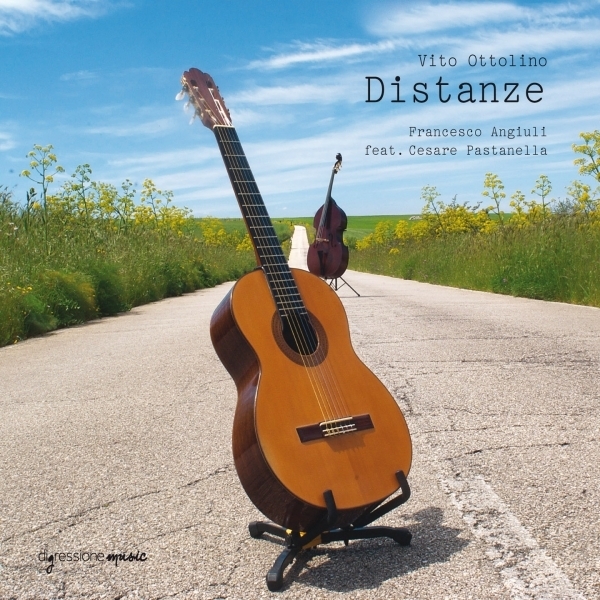 His latest work's "Distanze", published by Digressione Music, born as a collaboration with bass player Francesco Angiuli and the artistic contribution of Cesare Pastanella (percussions). I've been listening to the album for weeks, its content's almost completely made up of Ottolino's original compositions -there's just a Pat Metheny's song done as a tribute to the great guitarist & artist- and all of them can be considered as a result of his background which is somehow enforced and enriched also thanks to artists Angiuli (contrabass) and the already mentioned Pastanella. There're all sorts of very different cultures, and Ottolino's music is the bearer of an overarching, universal message. Rhythm and various influences come together, and do make this album some sort of a wise, wide mixture of different flavors, from jazz to world music, where classical guitar gives way to the jazz one, all of it counterpointed with bass and percussions. A highly enjoyable album this is, aimed at a varied audience, to the fans of the genre as well as to those not specifically accustomed to jazz. Usually, I tend to point out all songs I particularly enjoyed but, in this case, I'd like not doing it since all of them are truly remarkable and well-recorded, and if I had to choose it'll be unfair to the remaining ones. Also, I'd like to mention two people who contributed to this work, two artists with great talent and experience, namely Beppe Fortunato (keyboards) and Felice Di Turi (drums), who played in "Movie's Song" (former) and "Misunderstanding" (latter). CD can be easily found, streaming & download options are also available btw.